Will tablet PC makers follow the Oak Trail? Intel is soon set to launch a new-and-improved chip platform specifically for the booming tablet PC market. 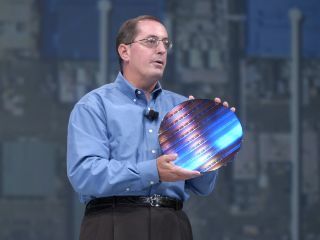 The launch of Intel's own inexpensive and low-power chip platform – codenamed Oak Trail – is set for early 2011. The Oak Trail chips boast improved energy efficiency and compare and compete well with similar low-power chips already on the market from Intel's competitors, such as the UK-based ARM who currently dominate the smartphone chip market. Intel marketing director Anil Nanduri said of Oak Trail: "The biggest power part of the tablet is the panel. In terms of an idle-use case we are competitive in a tablet usage compared to any other solution out there." Oak Trail will let users watch HD video on a tablet for up to eight hours at a stretch, claims the Intel man – which, if anywhere near the truth, suggests that new tablet PCs arriving later in 2011 will be even more ideal for long-haul flights and long trips. Apple currently owns a whopping 95 per cent of the fledgling tablet PC market, with sales predicted to soar in 2011 and a number of new Android-OS devices set to arrive on the shelves over the coming months. Samsung recently launched its Galaxy Tab in the UK, following Dell's launch of its Streak tablet earlier this year. Tablet shipments are predicted to grow by around 200 per cent next year, while more traditional laptops and desktop PCs will expand just 13 per cent, according to the latest report from iSuppli.